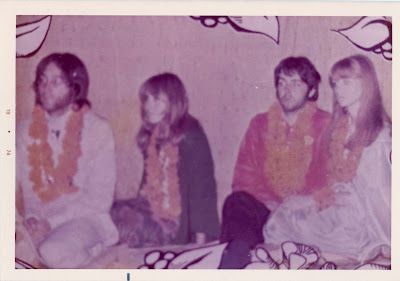 It is easy to think of the Beatles time in Rishikesh as well -- boring. 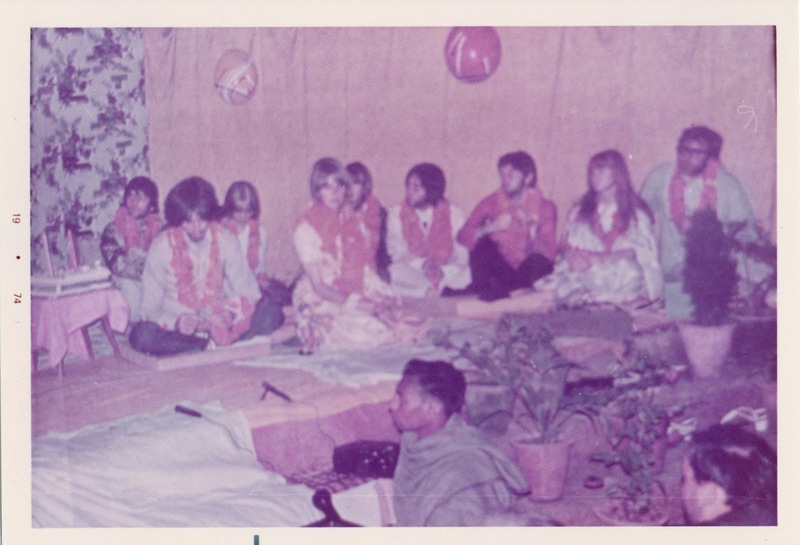 They sat around and meditated, ate nasty meals, slept and wrote songs. Not exactly the most exciting of days, especially for outsiders. However, when it was someone's birthday, these campers knew how to party! Point in case was George Harrison's 25th birthday that was celebrated while in Rishikesh. Here is a quote from Lewis Lapham's book With the Beatles that tells a little bit about the party. 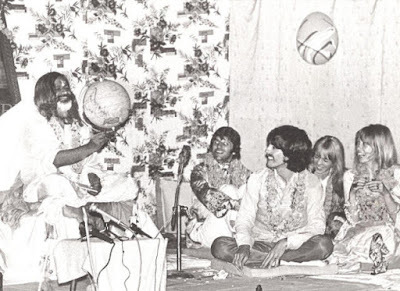 The Maharishi presented George Harrison with a cake and a plastic globe turned upside-down. 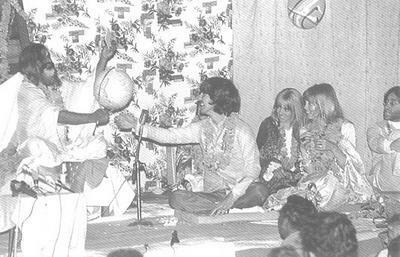 "This is the world," he said, "It needs to be corrected." 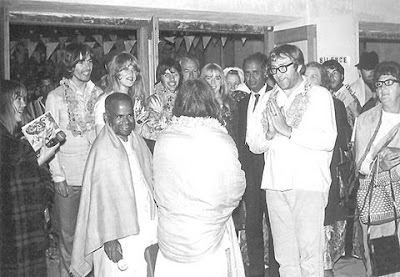 We sang "Happy Birthday" to George and then when the laughter and applause subsided, the Hindu porters laughed and danced and threw firecrackers at one another in the doorway of the lecture hall. There were Indian musicians at the party that performed music for everyone. I am sure George especially enjoyed the music that was provided for his party. 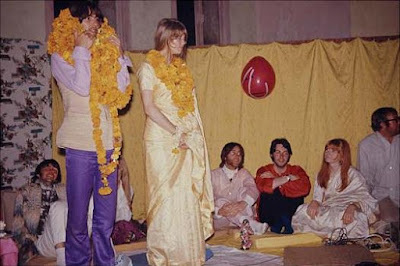 When they arrived the guests were given two sets of flowers to wear around their necks. 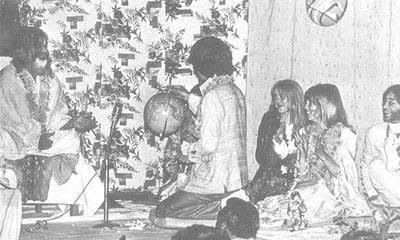 After the gift and the music, each guest came up to George and put one of the flowers around his neck. This must have been quite a funny time, has Mal Evan's flowers got caught up with the others George was wearing and by the end, George had a large stack of flowers and you could barely see him. I love all of these photos because first, they show a celebration of George Harrison and that alone is pretty awesome. 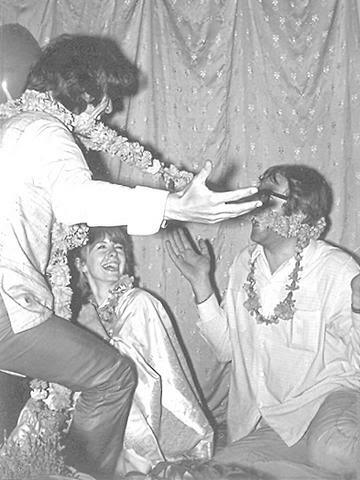 But also because they show the Beatles and their ladies looking really laid back and having a fun time. 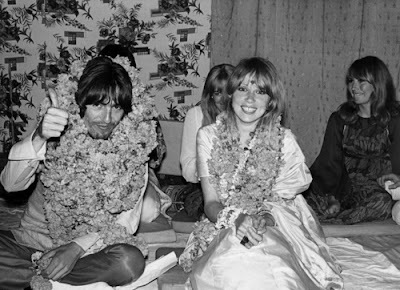 Maureen Starkey is laughing in many of the photos and so is Jane Asher. Even Cynthia is smiling! Ringo is laying back having a good time. John and Paul are sitting next to each other. We often think of 1968 as a dark dreary time for the Beatles --- but there were moments, such as this birthday party where things weren't so dismal. 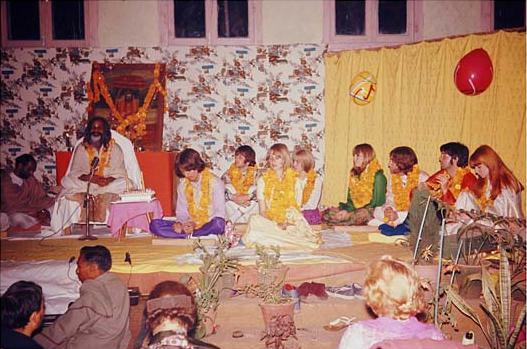 Of course, they would have been smoking loads of the local, quality weed.